I have seen several incarnations of cut-knurlers, including a 2 wheel cross hatch one that is quite complex to make. While that one (from HSM by McGyver) is on my ToDo list, I wanted to get one with some items that need some kind of knurl on them. Guy Lautard had drawn up one that is similar to some of the commercial ones available. That is what I built, more or less following his implementation. I used a diagonal wheel from the terrible push knurl holder that came with my AXA QCTP. It got its cutting edge sharpened on the T&C grinder. It works well once you get the angle and height set up correctly. I also have a cut knurler for a few months now and have been experimentig with it a little. What i found is that brass is a little bit tricky because the swarf tends to stick on the wheel and gets rolled back into the knurl, clogging the wheel and also the the knurl itself - which finally results in a poor finish. So what I tried was running it backwards and that worked pretty well - most of the chips fall down then. For steel, it seems to be better to do several passes for a good finish. I would be best to use a stream of coolant for knurling - but i don't have this on my lathe. I want to try a fogbuster (or similar) to see if this works for getting the swarf away but i'll first have to buy or make one. Yes the chips can be a problem. I use squirts of hydraulic fluid but still get marks on steel. I made drawings for a fogless coolant sprayer, will starting cutting metal today. The fogbuster patent is very helpful. I will try the run-in-reverse idea next time I do a knurl, great suggestion. This works only dry though because oil will keep the chips sticking to the workpiece. But if you machine brass then this is pretty much what you "need". I also thought about just a light stream of air to remove the chips right where they are produced. I started my fog buster clone today. But yes for brass air alone is probably best. 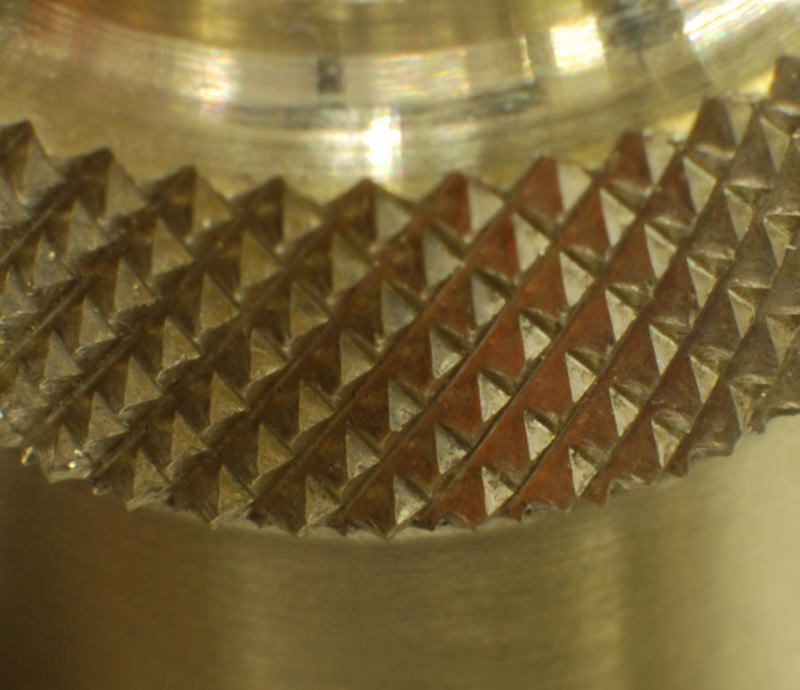 Cut knurling steel without oil makes a mess of the knurl, and more noise. Yes, steel should not be machined dry of course. Already because of the tool wear. And this is where the fogbuster might be a problem solver. Not having done much knurling at all, can you explain how a 'cut' knurler works, how is it different than a non-cut? Cut knurling - as it says cuts off some of the material. For cutting, the knurling wheel (with a sharp edge!) is tilted like shown in Gerrits video. What happens is that by rotating the knurling wheel, the teeth will move sideways relative to the workpiece and this is where the wheel cuts. 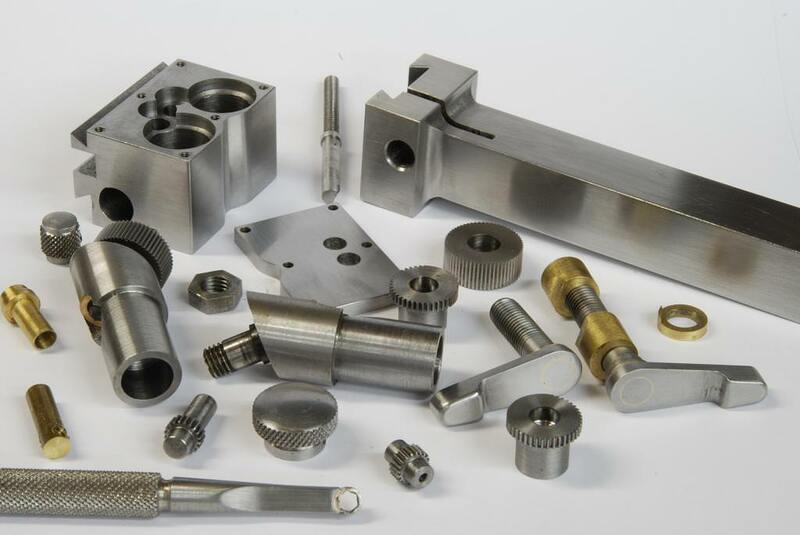 The benefits are (if the swarf is cleaned away properly and the tool is set correctly) better surfaces and a pretty much smaller amount of force required for knurling. Just to add a bit more on Florian's write-up: There are less forces required in general. The only real force if any is at the beginning when you plunge the wheel into the work piece (to approx. 50% of its pitch). A 1mm pitch knurling wheel would take 0.5mm depth. Once you get to that depth, then move axially at a reasonable feed rate. The Accu-Trak document that I linked to has details. They say to only traverse once but I have done 2 passes, the wheel syncs up on the second pass. (Reversing axially with the wheel still engaged made a mess the time I tried that). While you are supposed to use $$ wheels for this, you can approach decent quality with any wheel if you sharpen the cutting side. McGyver (published in HSM) designed and built a cross hath cut knurler, it uses 2 straight wheels. It is on my list but this was much quicker to build, I really need some grippy knobs for some projects. The video I made tries to illustrate the 2 main actions. 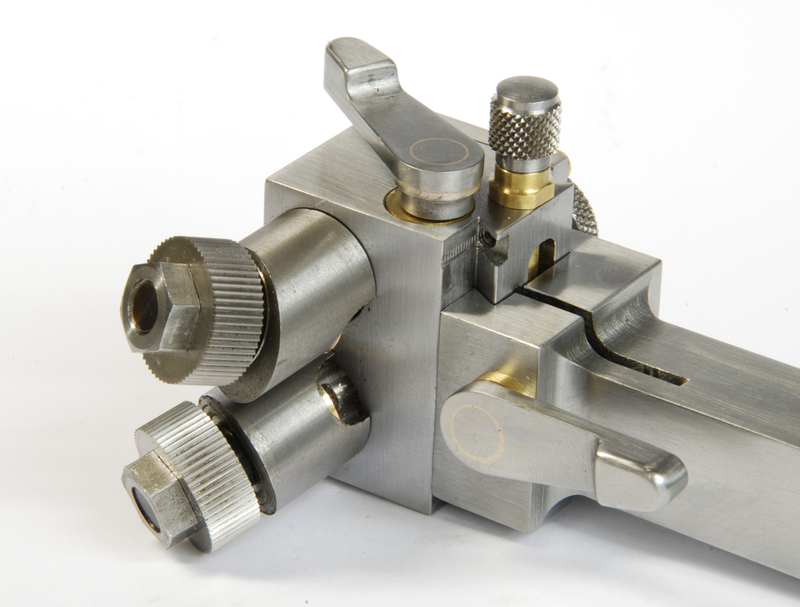 One side benefit from this type of tool is that you can knurl tubing as well since there is no crushing involved. I also thought about just a light stream of air to remove the chips right where they are produced. I was wondering about that too. Chris had done something with a decent aquarium pump and those flexible hoses (typically used for coolant) to blow off chips. I put together a similar system but I'm not sure it's powerful enough to blow chips that are covered in oil. McGyver (published in HSM) designed and built a cross hath cut knurler, it uses 2 straight wheels. Gerrit, that looks good. I remember the late John Stevenson also make straight knurls with angled wheels....and as pointed you, its straight wheels to make a cross hatch. 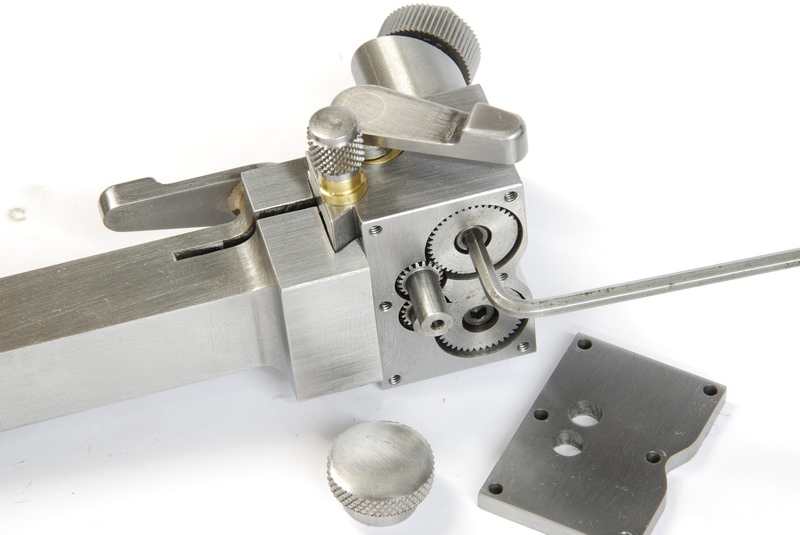 thanks for mentioning my knurling tool, always fun to do a show and tell so here's some photos. The Mark I was simple but a pita to use. The complexity came from solving two problems, 1) the angle of the wheels to the workpiece has to be changed for each dia, and the wheels have to be rotated in opposite directions, and 2) after rotating and locking, a convenient way to fine tune the height for even knurls was needed (desired). It was difficult to gauge how far to go, inevitably you'd not make everyone happy so I chose to make it as best I could. Its sort of pay me now or pay me later, the upfront complexity makes it so quick and easy to use. The brass knurl gives a sense of its capabilities as brass is difficult to pressure knurl. Cut knurlers are nice to use, one pass at full speed and you're done. That’s a nice looking bit of kit! Bad Behavior has blocked 13871 access attempts in the last 7 days.